FEMA and the American Red Cross produce a wealth of safety- and hazard-related documents. I’ve found Your Family Disaster Supplies Kit in multiple locations; the one here is from the University of North Carolina Wilmington’s emergency and safety information page. This is page one of four, each about 5 x 7 (click to view at full size). The idea seems to be to print them on both sides of an 8.5 x 11 sheet, then cut and fold into a brochure. 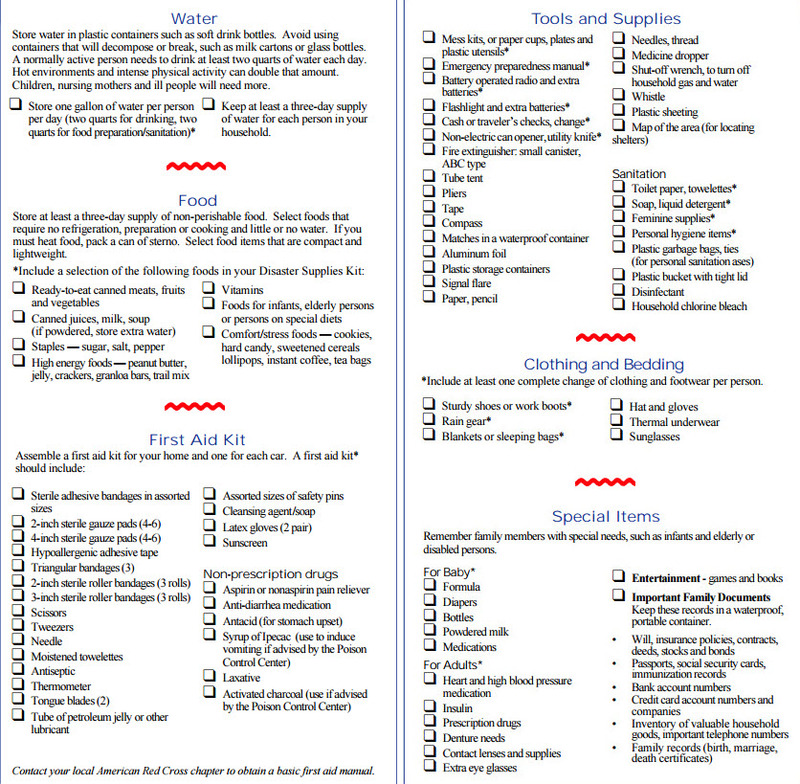 A supplies checklist covering items like food, water, clothing, and tools (pages 2 and 3). A guide to creating a family disaster plan (page 4). An individual would use this checklist to choose and organize supplies for a disaster such as a storm, an earthquake, or a spill of hazardous material. While the information is useful in many situations, the job aid is concerned with individuals and their personal safety, rather than with, say, a company’s employees at the workplace. Unlike procedures or decision tables, checklists don’t have a specific outcome. However, a good checklist helps a person to assess whether his planning or preparation is complete compared with the checklist’s elements. Pages 2 and 3 of the brochure provide a checklist of possible supplies to stock. In all, there are more than 80 items set off with squares. I can hardly resist calling them checkboxes, and particularly for a planning guide like this, I think blank boxes are a better choice than, say, filled-in circles. The designers have chunked information into six categories: water, food, first aid, tools and supplies, clothing and bedding, and special items. Some sections begin with general advice (“Water: avoid containers that will decompose or break”); there are a few logical subsections, like the four under special items. One size – fits most? I found many different forms of disaster-preparation guides, even when I limited my search to earthquake preparation. The topic is so big that you could fill dozens of pager with detailed information. To me, that’s a reminder: there’s no one right way to create this sort of guide. FEMA and the American Red Cross have done well to label it a disaster supplies kit. 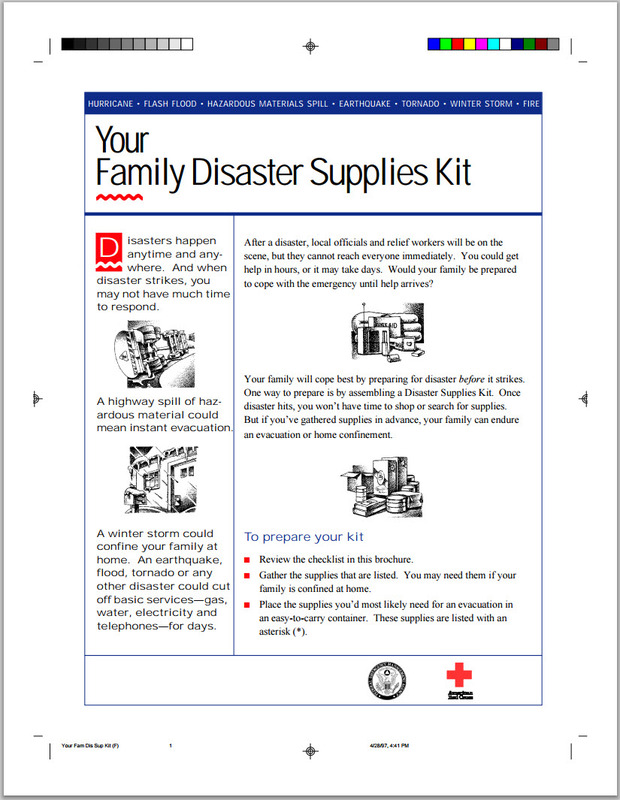 Page 4, Create a family disaster plan, is pretty sketchy — but FEMA has many other resources for planning.